Starting today, we're thrilled to begin accepting orders for the first small production run of Xtracycle's new EdgeRunner longtail cargo bikes, due to arrive at Clever Cycles in early January. These, along with their whole 2013 product lineup, are the most exciting things we've seen in years at Interbike, the bike industry trade show in September. I'll tell you why below, but a test ride is worth more than a million words. We have a demo EdgeRunner; ride on over to try it! EdgeRunner is Xtracycle's boldest entry into the category they virtually invented over a decade ago with their FreeRadical hitchless trailer. Unlike the company's previous conversion kits and Radish package, EdgeRunner is a one-piece frame, offering a much stiffer, stronger, more refined ride. 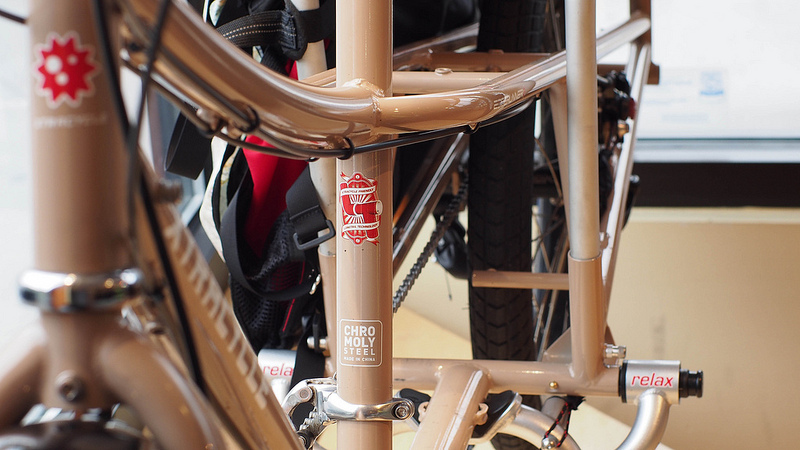 Alluringly designed in light resilient chromoly by multiple-NAHBS-winner (and world bicycle speed record holder!) Sam Whittingham, EdgeRunner's foremost technical improvement over otherwise similar longtails is a 20" rear wheel, which lowers the center of gravity of the load, and is stronger too. The smaller wheel also allows its axle to be further rearward than other longtails having the same overall length. The handling improvements of a load borne lower and more completely between the axles is hard to overstate. Finally, the smaller wheel produces more torque when electrified: EdgeRunner will come in an electric assist version! Alongside the new flagship complete bike, Xtracycle is also introducing completely new accessories called the Hooptie (which is a railing/monkey bar assembly to help passengers feel more secure), Stirrups (for little feet), UTube/RunningBoards (which provide foot support for even a second passenger in the aft position), and the SideCar (which is a sidecar, 250lbs capacity, crazy inexpensive). The bags and other key accessories have been made both better and cheaper too, so we'll be able to offer complete Xtracycles at unprecedented low prices in 2013. How about a complete folding Xtracycle for $999, the Cargo Joe? Next Summer, Xtracycle will introduce new longtail conversion kits called Leap 26 and Leap 29, cheaper, stiffer, and more broadly compatible than its original FreeRadical kits. Taken together, this thunderclap of new design work probably exceeds all previous Xtracycle development since 1998, when the company formed. Xtracycle has re-invented its own. So what happened? Well, as all this new work began, inventor and CEO Ross Evans got re-invented as a father! Carrying kids has always been one of many applications for an Xtracycle, but never before has the company shown such a tight focus on meeting the needs of families. We've practically raised our kids on the back of our Xtracycles, and we've set up hundreds of families with such setups over the years. As parents, Xtracycle's product line has never been more closely aligned with our core values, experience and vision for bicycles as everyday urban family transport. 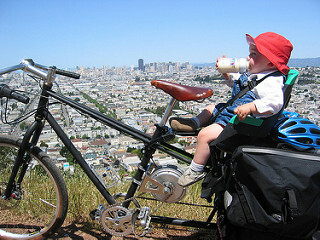 Xtracycle's products have had an incalculable positive influence in our lives. Clever Cycles would not exist if not for this influence. I (Todd) have told the story in fragments over the seven years this site has existed, but never all at once. That whole tale is too long, but a summary will explain why we're so proud to lead Xtracycle's renewed charge into Portland. 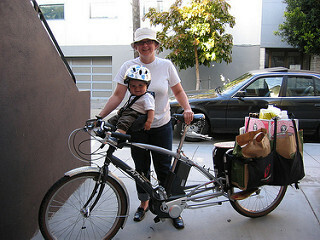 I bought what I'm pretty sure was the very first Xtracycle product sold in our then-home San Francisco, in early 2001. I was a little skeptical about converting a nice bike into a franken-hauler with a new product that had yet to prove its bold promises, so I bought a $60 MTB to convert. I sold my cargo trailer 2 weeks later: it couldn't carry passengers. Soon I began to regret having underestimated the goodness of the Xtracycle FreeRadical by joining it to a crummy MTB, so I got a nicer one. 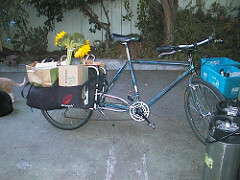 I hauled groceries, and construction and brewing supplies on it, and my wife and mom and dad (not all at once), all over San Francisco, or at least the routes that wouldn't destroy my knees and grunting reserves. I think I was the first person to attach passenger handlebars to my seatpost on an Xtracycle. Everywhere we went, every 20th person would act as if struck by some soft lightning, either staring gape-mouthed, or shouting out to us in amazement that such things existed. I began to feel like a reluctant revolutionary, riding a magical unicorn of a bike. Why didn't every biking household have one? We'd never owned a car, but this completely cemented our belief that we'd never feel the need, at least as long as we lived in a city. We became pregnant: we were going to raise our kid car-free, and Xtracycles were going to be key. We visited Amsterdam, neither the first nor the last time. Wandering around town before dawn, jet lagged, I watched the city wake up and get on their bikes. Glorious bikes! Every block had several of the new Bakfiets.nl Cargobikes parked out front in the rain, and there were even longtails! I came across a large kindergarten at opening time, just as many dozens of families converged on it on their bikes with 1, 2, 3 or more children aboard or alongside, some asleep, their breath steaming in December's late dawn air, fit happy moms and dads in their normal stylish clothes, doing their normal thing. Not a single car or bus to break the sound of laughter, bells, cheery greetings and leave-takings. Time stopped. It was so beautiful, so humane. When time started flowing again, I cried. Reluctant or not, I knew somehow I was going to help this become normal in my own country. The remainder of that trip, I analyzed how the bikes differed from Xtracycles, imagining a mutually beneficial harmonization of standards. Returning home, now reviewing my bikey life through Amsterdam goggles, I became sharply aware of how many more barriers there were to the magical unicorn Xtracycle becoming normal, at least in San Francisco. Apart from the fact that this city has the highest car density of any in America, the terrain made using the bike's amazing cargo capacity somewhat forbidding even to very strong riders. I was fit enough to do brevets, and had a 18-mile daily commute with hills and headwinds, but still I arrived many places pouring sweat, even in the city's cool climate. My knees hurt. I was tired, tired in a way childless people can't really know. I began to research electric assist systems. I bought a crank-drive electric bike, hacked the gearing extra wide, and turned it into what I think was the first assisted Xtracycle, in 2003. We charged it from our solar array. It was kind of thrilling that it worked at all, but I can't say it worked well. It was nowhere near stiff enough to handle the whole-family loads its motor would help it move up steep hills. Still, I rode it several thousand fast fun miles before its drivetrain failed expensively in under a year, and I didn't bother to fix it. I wanted to replace it with the ultimate (or at least the first) one-piece Xtracycle, with allowance for an assist system equal to any terrain. I got to noodling, literally making a model in perciatelli, tubular pasta. This project resulted in Xtravois, still in service 9 years later. 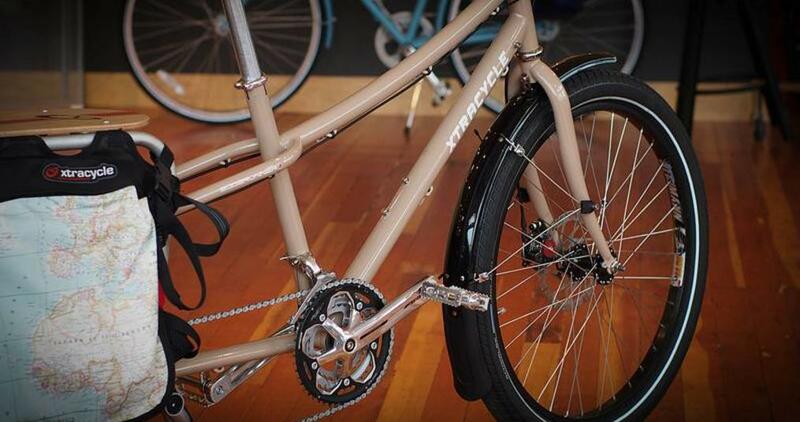 I'm proud that my original "stretch mixte" profile has become dominant among the many longtails to have emerged in the years following from artisanal builders as well as companies Surly, Kona, Yuba, Madsen, Rans, Sun, and even Trek. But where was Xtracycle, the progenitor and rightful chief commercial beneficiary of this concept? The child was gestating, keeping its powder dry: BOOM. We had built seven Xtracycles in three sweet years when I got laid off from my tech job. Our suddenly crushing San Francisco mortgage catapulted us to a new home in Portland, already more bike and family friendly. And much flatter, and wetter, about 8 miles on a side just like Amsterdam. We were unsure exactly how we'd make a living, except that it would involve Xtracycles, assisted when necessary. Months later, this site began, presenting our once-and-future assist product for Xtracycles, Stokemonkey. A year later, on a warm afternoon installing the second Xtracycle of our friends the Mullins, Dean Mullin proposed "let's open a bike shop!" In less than a year from opening, Clever Cycles was selling more Xtracycles than any other shop, a position only recently ceded to others in hotter growth markets. Xtracycles are thick on the ground in Portland now, no longer magical unicorns. We couldn't be more proud. We've never let up in beating the Xtracycle drum, even as the range of family solutions we offer has broadened dramatically, still guided by timeless moments of vision in Amsterdam. Even before we opened, we were pleased to beta test the first commercial one-piece longtail, Surly's Big Dummy, and we sell those to this day. Just last year, we designed our own successor to the original Xtravois, featuring a 20" rear wheel. We're happy to be off the hook to manufacture this bike, because now Xtracycle has made it nearly redundant, much lighter, prettier, and less expensively than we could. Everything that rises must converge! With the arrival of EdgeRunner, it feels like a large circle is closing to begin again. "Edge runner" refers to the growth habit of certain mycelia, fungal bodies who run rapidly and hidden along the edges of plant life, plant death, and soil. Edge runners' function is to catalyze new growth by reclaiming nutrients from complex dead matter, even the sometimes toxic wastes of human industry. They break down the old into the new, enabling generational change. The name EdgeRunner, apart from being a middle name of proud father Ross Evans' beautiful boy, befits Xtracycle's original hitchless trailer concept most plainly, recycling MTBs for practical use, inspiring, firing up the imaginations of thousands of people like us to reclaim our cities from car dependence. The present complete bicycle, not being converted from old, runs ahead in a broader course prepared by the first generation, reaching out toward families for whom cargo bikes are no longer mainly emblems of sacrifice, craftiness, and revolt, but more of practical aspiration, refinement, beauty: fresh culture. Once again, we have a demo model available for test rides. There is no substitute for test riding; we gave up trying to describe how bikes handle, fit, climb etc, over email or the phone years ago. But we think they nailed this one. It's the smaller of the 2 available frame sizes, non-electric version. We have a Hooptie, SideCar, and prototype of the new X2 bag for your trial as well. Cost is $1999 for the bike, with complete deck/bag packages starting at $149. A 50% deposit secures your claim to a bike from our small first shipment, due early January.